July ends with below normal rainfall across the country! Three upper air cyclonic circulations persists over India; one over north-west (it is weakening), central and eastern India. PWP downgrades the third spell in Sindh for this week (July 31/August 1) to ‘very poor’. Satellite image indicate scattered clouds over the province. Following is the rainfall recorded from July 1 till July 31 in Islamabad, Lahore, Karachi and Hyderabad; Sargodha is the only city that has crossed the monthly average of 108 mm by getting 160. 2 mm rainfall in Punjab. In the monsoon of 2012, Karachi received 1 mm rainfall till July 31. In the monsoon of 2012, Islamabad got 192.1 mm rainfall till July 31. In the monsoon of 2012, Lahore got 80.3 mm rainfall till July 31. In the monsoon of 2012, Hyderabad got 3 mm rainfall till July 31. Another spell brewing as well? Three upper air cyclonic circulations persists over India; one over north-west (it is weakening), central and eastern India. PWP maintains the chance of third monsoon spell hitting Sindh ‘moderate’ during the July 30 night/July 31. Three upper air cyclonic circulations persists over India; one over north-west, central and eastern India. A wave of monsoon clouds continue to stretch from west-central India towards northern Arabian sea, East of Oman. PWP upgrades the chance of third monsoon spell hitting Sindh from ‘poor’ to ‘moderate’ during the July 30 night/July 31. While PWP also upgrades the fifth monsoon spell hitting northern Punjab from ‘very high’ to ‘extremely’ from July 30. 4th and 3rd spell ended! An upper air cyclonic circulations persists over Jharkhand, it is moving westwards. 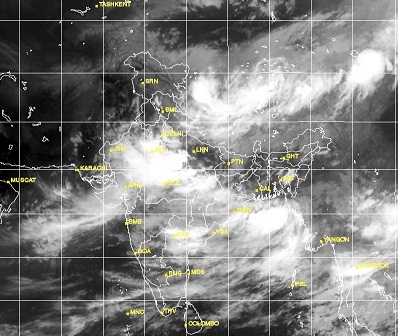 A wave of monsoon thunderclouds persists over western India stretching into the northern Arabian sea. PWP upgrades the chance of third monsoon spell hitting Sindh from ‘extremely poor’ to ‘very poor’ to ‘poor’ during the coming week. While PWP also upgrades the fifth monsoon spell hitting northern Punjab from ‘moderate’ to ‘high’ from July 30. Due formation of circulations over western India, there are slim chances of drizzle/isolated shower in south-eastern Sindh while drizzle in coastal parts either from July 28 night/July 29 night in the form of the third spell, these chances would remain active till this week. Upper and central parts of Sindh would witness partly/mostly cloudy weather depending upon the formation of thunderclouds. Due to the same circulations, isolated shower may occur in south Punjab and few adjoining areas of north-east Punjab. From July 30, there are chances of thunder/lightening with rainfall in parts of the northern Pakistan including Islamabad and Lahore in the form of fifth spell that was forecasted by PWP since July 25. No significant rainfall occurred in the country. Yesterday’s interaction between western and eastern winds in south Punjab resulted in a strong windstorm that collapsed the power system in Muzaffargarh. Western and eastern winds interacting over south Punjab! An upper air cyclonic circulations has moved into Jharkhand. Western disturbance ’15’ weakens and moves in a NE direction hence the fourth spell weakens as well. 4th spell: Very heavy rainfall in Sialkot – 128 mm in 7 hours! An upper air cyclonic circulations persists over north-west Bay of Bengal and adjoining Orissa coast. Western disturbance ’15’ over northern Pakistan, moving north-north-eastwards. Fourth monsoon spell starts on predicted date! Third monsoon spell should start as cloud formation taking place! A fresh upper air cyclonic circulation has formed in the north-west Bay of Bengal and adjoining Orissa coast forecasted by PWP since July 21. Western disturbance ’15’ lies over northern Pakistan. As forecasted by PWP since July 17, fourth monsoon spell has hit the northern areas of the country though it is mild in intensity, rainfall has been recorded in Islamabad and Murree. There are more chances of thunder/lightening with rainfall along with fast winds in the northern areas including Islamabad, Lahore, Peshawar and other adjoining cities. Slim chances of isolated heavy fall near Azad Kashmir-north Punjab border. Third monsoon spell could start in central areas (south Punjab) by tonight/July 26 although mostly light showers are expected there including Multan however passing clouds in lower central areas. Due to frequent formation of a thundercloud over Gujarat, drizzle may occur over south-eastern and coastal Sindh, however upper and central parts of Sindh would remain dry with passing clouds till 12 to 24 hours. Second spell ends in South on July 23 with no rainfall! Yesterday’s UAC over Uttar Pradesh, it is moving in a WNW direction. Western disturbance ’15’ over northern Afghanistan and adjoining Pakistan, it is likely to affect the northern areas of the country. Another UAC would form on July 25/July 26. Low pressure over Madya Pradesh has rapidly weakened and has dissipated over the same area however has caused an UAC to form over eastern central India. Another weather system would form in the Bay of Bengal during the middle of the this week. Rainfall occurred in remote areas of Sindh, hence not measured. Low pressure area over Chhattisgarh is now situated over Madya Pradesh and adjoining Chhattisgarh, it is likely to move in a WNW direction and weaken. Another weather system would form in the Bay of Bengal during the middle of the coming week. Moisture from this low pressure has already caused an expected thunderclouds to move into south-eastern Sindh where showers have occurred with thunder/lightening however those thunderclouds are now weakening as they move in a WSW direction. There are chances of more thunder/lightening with showers in south-eastern Sindh till 24 hours with drizzle in coastal parts including Karachi. The weakening low pressure could cause moisture incursion to take place over upper parts Pakistan after 24 to 36 hours and hence the fourth monsoon spell (third in central areas) could start by July 24/July 25, PWP maintains the chance of that monsoon spell to ‘extremely high’. Another monsoon spell is also expected in the country during the early first week of August. Since unexpected monsoon rainfall has occurred in south-eastern Sindh, therefore PWP names it the second monsoon spell. However the second monsoon spell has failed to advance further westwards in the province like the first one. PWP maintains the chance of ”third” monsoon spell hitting Sindh during the late last week of July to ‘extremely poor’ at the moment. Low moves inland – Another weather system forming! Third spells ends in Punjab! Low pressure area has moved inland and it is now situated over Chhattisgarh, it is likely to move in a WNW direction, it could cause moisture incursion to take place over upper parts Pakistan. Another weather system would form in the Bay of Bengal during the middle of the coming week. Western Disturbance ’14’ persists over the extreme northern areas of Pakistan. The third and second monsoon spell in northern and central parts respectively have ended without significant rainfall. However stray thundercloud could form that could cause showers with thunder/lightening at few places of upper and central parts. There is also a chance of drizzle/isolated shower in Karachi and coastal Sindh. High and Mid-level clouds over Gilgit region. Weak thunderclouds moving into south Punjab from Rajasthan while a mid-level cloud formation over central Balochistan and adjoining Sindh is moving westwards. High level clouds are moving into lower Sindh from western Gujarat. Yesterday’s upper air cyclonic circulation has intensified into a low pressure area near Orissa coast and West Bengal. It is likely to move towards central India, it could affect Pakistan. Thunder/lightening with rainfall is expected in the northern areas of the country including Islamabad as third monsoon spell is expected to continue till 24 to 36 hours (early July 22). Western disturbance ’14’ over Afghanistan and adjoining Pakistan has moved into Pakistan. The third monsoon spell has remained weak due to lack of moisture from surrounding areas. Second monsoon spell could start from tonight in the central parts (south Punjab) of the country as there are chances of showers. Last week of July could witness some improve monsoon activity over Pakistan as conditions over India are becoming favorable after 36 hours. An upper air cyclonic circulation has formed in the northern sector of the Bay of Bengal, it may intensify into a low pressure area and move towards central India, it could affect Pakistan. More thunder/lightening with rainfall is expected in the northern areas of the country including Islamabad as third monsoon spell is expected to continue. Western disturbance ’14’ over Afghanistan and adjoining Pakistan is would move into Pakistan on July 20 as forecasted. Second monsoon spell would start from July 19 night/July 20 in the central parts of the country. Last week of July could witness some improve monsoon activity over Pakistan as conditions over India are becoming favorable. Third monsoon spell has started in the country around PWP’s forecasted date! Western disturbance ’14’ is over northern Afghanistan and adjoining Pakistan. Mostly dry weather is expected in many parts of the country till 12 hours however thunder/lightening with rainfall (chance of isolated heavy falls) and fast winds is expected in the northern areas including Islamabad as the third monsoon spell has started. Thundercloud that entered the north-western parts from Afghanistan intensified into a well-developed thunderstorm over the northern areas and brought thunder/lightening with rainfall and strong winds to Islamabad, Rawalpindi, Mirpur (Azad Kashmir), Jhelum and adjoining cities, the wind speed in Islamabad reached 69 miles per hour (111 km/h). PWP on the mid-day of July 18, upgraded the chance of the third monsoon spell (second in central parts) hitting the northern areas to ‘very high’ on July 19 however the monsoon spell has started a day earlier in the northern areas. PWP has also upgraded the fourth monsoon spell (third in central parts) hitting the northern parts to ‘moderate’ during the late last week of July. Mostly dry weather is expected in the country however light showers with fast winds could occur at few isolated places of northern and central parts of the country. An upper air cyclonic circulations would form in the Bay of Bengal during late this week and move towards central India. PWP forecast ‘high’ chance of the third monsoon spell (second in central parts) hitting the northern parts from July 19/July 20 while ‘poor’ chance of the fourth monsoon spell (third in central parts) hitting the northern parts during the late last week of July. An upper air cyclonic circulations would form in the Bay of Bengal during late this week and move towards central India. Monsoon (Second and first spell) has ended in the country, no monsoon showers expected in the country till few days. Mostly dry weather is expected in the country however light showers with fast winds could occur at few isolated places of north and central parts. Western Disturbance ’13’ has moved into Indian Kashmir. Monsoon has been inactive, rather on break over the north-western parts of India. With the arrival of Western disturbance ’13’, monsoon has intensified over the upper parts of Pakistan. It is affecting the northern and central areas of the country due to which thunder/lightening with rainfall (Mostly isolated heavy rainfall in north-eastern Punjab including Islamabad and Lahore) is likely in many cities of upper parts including some cities of south Punjab where there are few chances of isolated heavy rainfall. This activity (Second and first monsoon spell) would continue till two days. Thundercloud is moving over south Punjab while high level clouds over Gilgit region. Much of the lower parts of the country have remained dry with no cloud formation however drizzle/isolated shower may occur in Karachi till 48 hours. As forecasted by PWP on July 9, the first monsoon spell starts in south Punjab as Bahawalnagar got 25 mm today. The monsoon spell over the northern areas and adjoining central areas would intensify in the next 12 to 24 hours therefore thunder/lightening with rainfall (Mostly isolated heavy rainfall in north-eastern Punjab including Islamabad and Lahore) is likely in many cities of upper parts including some cities of south Punjab where there are few chances of isolated heavy rainfall. Much of the lower parts of the country have remained dry with no cloud formation. Yesterday’s low pressure has weakened into a upper air cyclonic circulations, it is an unimportant weather system. PWP forecasted on July 9, second monsoon spell hitting northern areas including Islamabad on July 11 late, thus second monsoon spell has hit these areas on July 11 mid-night. On July 9, PWP forecasted monsoon advancing into southern Punjab on July 13, thus now PWP upgrades 1st monsoon spell hitting southern Punjab to ‘very high’. More thunder/lightening with rainfall and winds is likely in the northern areas and few adjoining central parts. Western winds are also prevailing over the extreme upper parts of the country. Thundercloud that formed over western Sindh is moving eastwards, another over central parts of the country. There are also chances of some isolated showers at lower central Balochistan. Nagar Parkar got 28 mm. Yesterday’s low pressure over Madya Pradesh intensified into a well-marked low pressure over Madya Pradesh-Rajasthan border during the mid-day. During the same time (at about 2:00 pm PKT), PWP upgraded monsoon hitting Sindh to “high” in the monsoon mini updates. PWP forecasted monsoon hitting Sindh on July 10 late, it did so on July 10 night. Thunderclouds are forming over lower central Balochistan, moving into Iran. The well-developed thunderstorm has gripped all parts of Sindh, southern end over Karachi. Yesterday’s UAC over Madya Pradesh has further intensified into a low pressure area. With its formation, monsoon has revived once again. It is moving towards Sindh province, high level clouds have already started penetrating. 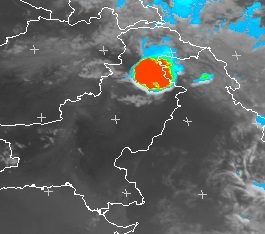 Well-developed thunderstorm has also formed over central Balochistan that is moving westwards. Another UAC over north-western Bay of Bengal, is over Orissa coast. It is expected to move WNW. PWP forecast the 1st spell of monson hitting Sindh during the mid of this week to “moderate”. Yesterday’s upper air cyclonic circulations over Jharkhand has moved into Madya Pradesh. Another has formed in the north-western Bay of Bengal, it is expected to move WNW. Monsoon has fairly remained poorly disorganized over the north-western parts of India, expected to re-organize. Pre-monsoon drizzle continues in the southern city of Karachi. Drizzle occurred in the city during the early hours of the day while another sharp drizzle occurred around 5:00 pm PKT at Stadium Road. Few high level clouds that entered from western Gujarat are dissipating over Karachi city after passing through SE Sindh. There are chances of pre-monsoon drizzle/isolated showers in south-eastern Sindh including Karachi. Fresh UAC over Jharkand however monsoon flow has slightly weakened over north-western India. Yesterday’s UAC over eastern Madya Pradesh and moved into Utter Pradesh. The another UAC over Arabian sea has dissipated, it has caused weakening of the monsoon. Monsoon has advanced into some parts of Gujarat and eastern Rajasthan. Today spotty showers with thunder/lightening occurred over New Delhi that broke the 8 day heat spell in the city. Some showers also occurred in northern parts of Pakistan including Sialkot that were helped due to the prevailing western winds. Karachi also witnessed pre-monsoon drizzle during the morning and night times. Pre-monsoon clouds were seen moving from upper Gujarat into northern and south-eastern Sindh and adjoining Punjab. Monsoon has not yet advanced into any part of Pakistan although it has managed to advance into Haryana and eastern Punjab. PWP had written in the update article that monsoon might either hit the country on July 6 or July 7, thus PWP would wait another 24 hours. However PWP still maintains the monsoon hitting the country to “high”. There are chances of monsoon thundershowers with strong winds in the northern parts including Islamabad on July 7, thus PWP might declare monsoon over Pakistan on July 7. Yesterday’s UAC over Jharkhand is now over eastern Madya Pradesh. Another UAC over north-eastern Arabian sea near Gujarat-Maharashtra. There are chances of drizzle/isolated shower in southern-eastern Sindh, northern and northern-eastern Punjab. PWP upgrades monsoon hitting the country to “high”, there are chances that season’s first proper rain could occur in the northern parts on July 6 as written by PWP few days back, the intensity would be mostly light with spotty moderate falls that would continue till few days. Mid-level clouds coming into south-eastern Sindh from Gujarat, few clouds also formed over lower southern Punjab from Rajasthan that are now dissipating. Western winds are also bringing moisture to the northern and central parts of Pakistan. Upper air cyclonic circulations that was over north-western Bay of Bengal, is now located over Jharkhand, another over north-eastern Arabian sea near Gujarat-Maharashtra. Thunderstorm is over northern Gujarat, southern Rajasthan and adjoining Maharashtra, it is moving in a SW directions, some clouds over south-eastern Sindh that could bring drizzle/isolated shower till 6 to 12 hours. PWP maintains 1st monsoon spell in the country to “moderate” during the late first week of July. Upper air cyclonic circulations in the north-western Bay of Bengal is expected to move in a WNW direction, another over north-eastern Arabian sea near Gujarat-Maharashtra. Pakistan Weather Portal (PWP) forecasted on June 27 monsoon hitting the northern parts of the country during the late first week of July. On July 1, PWP told that the chances of monsoon hitting the country are “moderate”, the Portal maintains that for 6 to 12 hours. Upper air cyclonic circulations in the north-western Bay of Bengal is expected to move in a WNW direction, another over north-eastern Arabian sea near Gujarat-Maharashtra. Pre-monsoon moisture is penetrating into south-eastern Sindh, chances of drizzle/isolated shower till 24 hours. Northern parts still under the influence of western winds. PWP maintains 1st monsoon spell in the country to “moderate” during the late first week of July. An upper air cyclonic circulations persists near western coast of India in the Arabian sea while another over the north-western Bay of Bengal. Monsoon rainfall can occur in northern Pakistan during the late first week of July while early second week of July in southern parts. PWP upgrades 1st monsoon spell in the country to “moderate”. Strong thunderstorms east of Gujarat, over western Maharashtra. Weak thundercloud that formed over south-western Sindh is has slightly moved westwards, indicating the strengthening of eastern winds.